Now I know I don’t do a lot of these things (book reviews), mainly because I don’t read as much as I would like to and also because I usually forget what the book was about just a week after reading it. I have Suzanne Collins (author of Hunger Games Trilogy) to thank for getting me into reading again. This post however is not about Hunger Games or Suzanne Collins (although I will mention them a few times), it is about this incredible book “Divergent” by Veronica Roth. After finishing up The Hunger Games Trilogy I started to panic thinking “I will never find another book like this! !” so I went to Goodreads and searched for other Dystopian novel recommendations. Dystopia is defined as: a society characterized by human misery, squalor, oppression, disease, and overcrowding. Sounds like kind of a downer I know… I think the reason why this genre is so popular right now is because we all have that feeling that the world might end one day, maybe soon, maybe later, and we might be just a little bit curious as to what the world will be like leading up to that. I’m a Christian and I really love to read The Book of Revelation and learn about the end of the world all because of this curiosity. So like I said before I went to Goodreads and they have a VERY helpful list of books to read if you are looking for a dystopia themed book. Divergent was high on the list right after The Hunger Games. I read all the reviews on this book and all of them were very promising but I was also hesitant because I didn’t think there would be a book out there as good, or even better than the Hunger Games…I was so wrong. 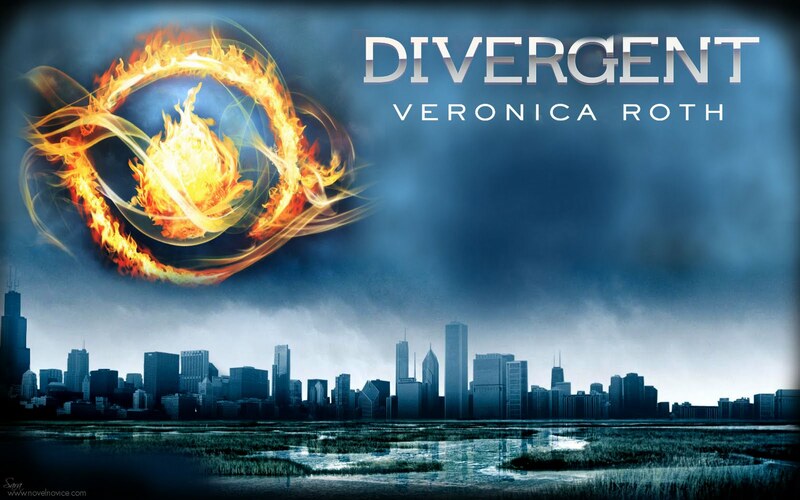 Divergent is a novel written by Veronica Roth which takes place in Beatrice Prior’s (main character) Dystopian Chicago where society has been completely broken. As a result the humans separate into 5 different groups of people called factions. The factions are all based on a human ideal that they feel is the opposite of what they think ended the world. The first faction you read about in the book is called Abnegation; the selfless. It is the faction that Beatrice is born into. The people of Abnegation believe that the society was destroyed by selfish people. Abnegation people strive to be selfless, doing community service and charity. They always wear the color grey and are not allowed to look in the mirror on the second day of every third month. They eat very plain food, anything of color or extravagance is too much of an indulgence. They mostly spend their time helping each other and helping the other factions, and also the faction-less which are the people that don’t survive initiation. The other main faction in the book is called Dauntless; the brave. Dauntless people believe that society was destroyed by being cowardly. The Dauntless wear black clothes, have many piercings and tattoos. Their main job is to protect the fence around the city. The other three factions in the book are Candor which is devoted to honesty and believe that liars destroyed society, Erudite who are devoted to a life of learning and believe that society was destroyed by lack of knowledge, and Amity which is devoted to peacefulness who believe that society was destroyed by war and violence. What happens is you’re born into a faction and raised there for 16 years and on a specific day of every year, all the 16 year-olds have to attend the choosing ceremony where they decide which faction they want to devote the rest of their lives to. The day before the choosing ceremony they take a test in which their brain patterns are stimulated and it concludes what faction they belong in judging by the which of the five characteristics are strongest in their mind. When Beatrice goes in for her test she does not react to it the same the others do. She is equally compatible with three of the factions which means she is “Divergent”. Divergent people are seen as a threat to the government because they can’t be confined to one faction, and in the book the government kill the Divergent unless they keep it a secret. On choosing day it is up to her to decide whether to stay with her family in the Abnegation faction forever or leave them to pursue what she really is. Beatrice decides to leave her faction Abnegation and transfers to Dauntless. The biggest part of the book is the initiation. In every faction everyone must complete some type of initiation to be accepted as a member. For example in Candor their initiation is full of lie detector tests and truth serum, Abnegation initiates do community service, and Dauntless initiates train in combat, weaponry, and fearlessness. If they fail the initiates they become the factionless or homeless who live on the streets and get taken care of by Abnegation. More than anything this book is a thriller. I found myself constantly on the edge of my seat unable to stop reading, needing to know what was going to happen next! Of course like all good books there is romance, and also a lot of violence. Reading it, I couldn’t get used to the fact that in the Dauntless faction guys and girls were put up against each other in combat to basically fight until someone is physically unable to continue (those parts were kind of hard to read). What I liked about this book was that people weren’t dying of starvation/desperate for food like in The Hunger Games. People in the book Divergent lived just like we do. This book is mostly relate-able which I think is really a great quality for a dystopian book to have, so that even though you are reading about the future, it’s not short of situations that we may go through in our everyday lives. Veronica Roth is a month away from releasing the next book in the Divergent series entitled “Insurgent”. She also signed a deal with Summit (the studio that brought us Twilight) to make a movie adaptation of her book. The writer of the new movie “Snow White and the Huntsmen” Evan Daugherty will be working on the adaption..I don’t know about you but if you ask me this only means amazing things are to come! Eek! On a closing note, I highly recommend you read this book, especially if you loved Hunger Games, I promise you won’t regret it! Unless you live under a rock you have hear that the most popular and talked about YA book series right now is called The Hunger Games by Suzanne Collins. 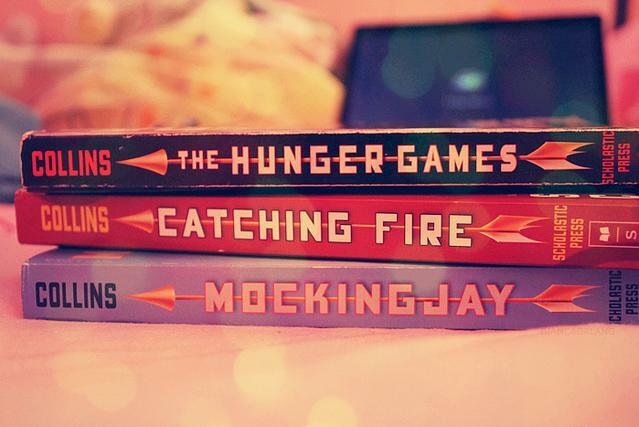 It’s a three part book series, it consists of “The Hunger Games”, “Catching Fire”, and “Mockingjay”. A couple months ago I had many friends come to me and go on and on about how unbelievable these books are, this made me definitely consider reading it but what really made up my mind was seeing the movie trailer for the first on screen installation of the series (midnight showing is TONIGHT YAY!). As lame as it sounds I am always one to see the movie instead of read the book he movie is based on, mainly because I am a super slow reader (I blame it on ADD). Twilight was the first series I had read before the movies came out…and yes I am a “Twi-hard”. Anyways every time I would see The Hunger Games trailer it would give me chills all over, it had an affect on me that’s for sure! The day I bought my Kindle Fire, I immediately purchased the first Hunger Games book and read a couple hundred pages in the first hour I had it! I read the first book in three days (which btw is a record for me). I read the second in 5 days, and took my sweet time with the last, feeling very sad about it all coming to an end. Hunger Games is a story that revolves around the main character, Katniss Everdeen, a 16 year old girl who lives with and takes care of her little sister and her mother. It takes place in the ruins of North America, now called Panem. In the middle of Panem is the Capitol where the President and all the wealthy glamorous people live. The rest of Panem is cut into 12 districts, each known for their specific specialty (Masonry, Coal Mining, Fishing, Transportation, Lumber, Textiles, Grain, Livestock, Agriculture, Power, Technology, and Luxury). Katniss is from District 12. Her father died a few years prior to the beginning of the first book and she is considered the head of the household, taking care of her little sister Prim, and their mother. Every year, one boy and one girl between ages 12 and 18 is selected from each of the twelve districts as tributes, who prepare for a week and then go into an outdoor arena to fight to the death. The event is nationally televised as mandatory viewing for all citizens and the last living tribute is declared the winner. Prim, Katniss’ little sister who is just 12 years old is chosen as the female tribute for district 12 which results in Katniss volunteering to take her place. Peeta Melark, a baker’s son is chosen as the male tribute. Katniss, Peeta, Gale (Katniss’ best guy friend and hunting partner) have quite the love triangle not much different from the Edward, Jacob, Bella triangle..minus all that supernatural stuff. You might ask yourself how they can make 3 books out of this story when the first book already has them in The Games, I thought this too but you will be PLEASANTLY surprised. After reading this series, which btw was the fastest I have ever read anything, I can’t believe I hadn’t heard of these books sooner. I am so anxious to spread the word about them! Please read these books! If you like action/suspense movies that keep you on the edge of your seat, these books will do that. If any of you have read the books let’s talk about it! What were your favorite parts? What are you most looking forward to seeing in the movie?! Rating: on a scale of 1-10…I give these books a 20! !